If you type Glacier National Park into your web browser, many of the search results reference Montana’s large national park of the same name. If you dig a little deeper, you will uncover one of BC’s most spectacular and challenging destinations, which covers almost 1400km2 of BC’s Selkirk and Purcell Mountains. Glacier National Park, in BC’s Kootenay region, is the first national park established in British Columbia and is one of the most interesting parks I have visited, as the spectacular views from the highway are juxtaposed with the challenges of accessibility. For much of the year, Glacier National Park is blanketed in up to 10 metres (yes, metres!) of snow, making the park inaccessible to all but the most experienced backcountry travellers. While the Trans Canada Highway cuts directly through the park, Rogers Pass can be one of the most treacherous sections of highway in the province with over 130 avalanche paths affecting the highway. By the time the snow melts away in the summer months, the Grizzly Bears have emerged from their winter slumber and many of the hiking trails in the park have restricted access, requiring groups of four people over the age of 12 to hike within three metres of each other. Backcountry travel in Glacier National Park is not for the faint of heart! Fortunately, Parks Canada has established numerous points of interest within the park that don’t require quite as much dedication and make the park a perfect place to stretch your legs, camp for a few days, and experience some of what the park has to offer. Bear Creek Falls: A short but steep downhill walk brings you from the highway down to a spectacular waterfall. In the summer, enjoy the cooler temperatures the gorge offers by packing a picnic to enjoy along the creek. Glacier House: A luxury destination in the mountains from the early 1900s, the Glacier House hotel was established by the Canadian Pacific Railway. When the railway was re-routed through the 9 kilometre long Connaught Tunnel in 1917, visitors to Glacier House dramatically decreased and the resort was closed and eventually dismantled. Today, you can explore the ruins of the resort near the Illecillewaet Campground. Rogers Pass Discovery Centre: A National Historic Site in its own right, the Rogers Pass Discovery Centre is the only part of Glacier National Park that is accessible year-round. An excellent interpretive centre tells the history of the area and the nearby Rogers Pass Summit site offers spectacular views and informative outdoor displays. Rock Garden: This walk only takes about 20 minutes, but take your time and explore the moss and lichen covered boulders deposited during the last ice age. The trail consists of a jaunt through the forest, numerous rock staircases, and a trail through large boulders, so bring appropriate footwear. Loop Brook: Loop Brook is one of my favourite destinations in Glacier National Park. The trail starts at the Loop Brook Campground and travels just over a kilometre and a half through the forest along sections of the old railway grade. The highlights of the hike are definitely the enormous stone pillars that once carried the railway in a loop through the valley in order to reduce the grade of the railway. Excellent interpretive signage along the trail adds to the experience. High-Elevation Hiking: Undeniably, one of the best ways to experience Glacier National Park is to take a hike in the high country. There are numerous trails in the park and the information desk at the Illecillewaet Campground – where many of the most popular hikes depart – has a sign-up sheet for those people wanting to join up with others to form groups of 4. While in the area, consider visiting Mount Revelstoke National Park and Yoho National Park. Take a day trip to Golden or Revelstoke to experience life in a mountain town. Both offer many opportunities for eating, drinking, and recreation. Plan for a meal at the Wolf’s Den in Golden for one of the best burgers you will ever eat. In Revelstoke, stop by the Monashee Spirits Distillery to sample locally made liqueurs. Glacier National Park offers three campgrounds: Illecillewaet, Loop Brook, and Mount Sir Donald. All campgrounds are first come first served and offer a place to stay right in the heart of the park. Glacier National Park is a dream destination for many backcountry and mountaineering enthusiasts, but it also has much to offer the casual visitor. There is a huge variety of hiking trails, from casual walks to demanding backcountry excursions. I have been to the park several times, but I feel like I have barely scratched the surface of what Glacier National Park has to offer and it is one of those destinations that keeps calling me back over and over again. For more campgrounds in and around British Columbia check out Where to Camp at Camping & RVing BC. Kimberly is a Special Education, Elementary School teacher in Hope, BC. Previously having worked ten years at the Hope Visitor Centre & Museum promoting tourism in Hope and British Columbia, Kimberly worked on many local history projects in the museum as well as researching and writing articles for the local newspaper. Kimberly loves travelling with her husband Dale and their dog Alpine. In the fall of 2014, they spent the first 78 days of married life travelling and camping their way across Canada - just the two of them and the dog - travelling in a Hyundai Elantra! 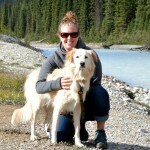 Kimberly loves various outdoor recreation types and exploring our beautiful province. 0 thoughts on "Glacier National Park is a Spectacular Destination in BC & its Free to Visit with Your Canada 150 Parks Pass"